Dirty Dangle Hockey: Did God Tell Brian Rafalski To Retire? Did God Tell Brian Rafalski To Retire? Last week, Detroit Red Wing defenceman Brian Rafalski decided to call it quits at age 37 and retire from professional hockey. By doing so, Rafalski turned down making $6M dollars next season on the last year of his $30M, five-year contract. For an average dude like me who lives pay cheque-to-pay cheque and considers going to East Side Mario's a fancy dinner - it blows my mind when professional athletes retire with some gas left in the tank. Scott Niedermayer did the same last year and retired at the age of 36. With his skill set and skating ability he could have played till he was 40 easily. I guess it's hard for fans to understand how you can turn down that type of money for playing a game that most of us grew up loving and playing for free. There are still old beer league players who work 50 hours a week to support a family, but still find the time to sneak off at 10pm on a Sunday night to get blown out by the new young team in their league. You might think it's crazy retiring when you can still be a good player. Rafalski did battle some injuries this season and played a career low 63 games. But he still managed to get 48 points in those games. He was still a great puck moving defenceman and a top powerplay set up man. During his retirement he stated that he was on the trainer's table every day getting treatment. But isn't that part of being a professional athlete? No pain no gain. This year, Rafalski's Red Wings teammates say that he underwent a change this season, that saw him become more focused on his faith. He expressed his faith at his press conference, stressing that he wants to serve God, his family and others as he turns away from hockey. Rafalski even finished his presser with a reading from the Bible. Perhaps playing for the Devils all those seasons or selling cigarettes after university really weighed on Rafalski's mind these past few years. I wasn't a huge Rafalski fan. Never have been a fan of soft players, but you have to admire the determination he showed by not giving up on his dream. After four years of college hockey and not being drafted or even signed to play in the AHL, Rafalski headed over to Europe. After playing overseas for 4 years, and being considered by the Sporting News as the best hockey player not playing in the NHL in 1999, he finally got noticed and signed with the New Jersey Devils. Rafalski retires with an impressive resume after 11 NHL seasons with 3 Stanley Cups and 515 points in 833 games. Amen. 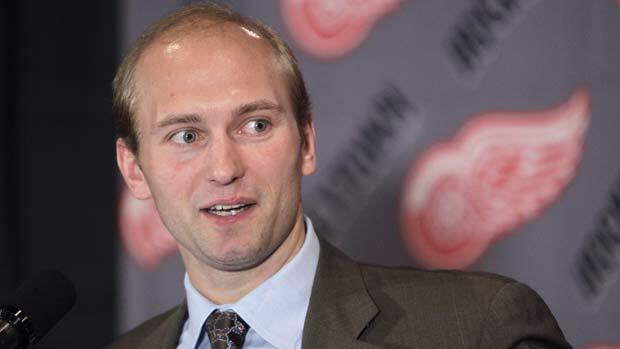 If the Red Wings lose Lidstrom they are going to have a pretty weak backend. Do they go after Kaberle? Remember these guys actually get pension money too. His back was fucked up all season, I don't blame the guy one bit. Rafalski was such a great passer and could see the ice so well. He will be missed forsure next year.